As Bolivia heads towards its December 6 national elections, the right-wing opposition has again turned to violence and disinformation to try to halt the process of change led by the country’s first indigenous president, Evo Morales. On August 11, letter bombs sent to social movements were discovered and deactivated. One of the bombs detonated in the hands of the wife of Fidel Surco, a leader of the National Coalition for Change, which unites most of Bolivia’s indigenous, peasant, worker and popular organisations. She was hospitalised and treated for severe damage to her hands and eyes. Sergio Loayza, vice president of Morales’ Movement Towards Socialism party (MAS), said “[these] violent acts of terrorism are aimed at frightening our leaders” because the right wing knows “that they cannot win the elections”. Together with Rosaria Apaza, from the MAS national leadership, Loayza spoke to Green Left Weekly at an international seminar organised in Sao Paulo, Brazil by the Socialism and Liberty Party over August 17-18. The letter bombs came only months after a terrorist cell made up of foreign and Bolivian mercenaries was disbanded in April in the city of Santa Cruz, the heartland of the right-wing opposition. The mercenaries were found with plans to assassinate Morales and members of his cabinet. A cache of rifles, munitions, and plastic explosives was also discovered. Since then it has been revealed that right-wing opposition leaders had funded the terrorist cell. In September 2008, the rich elites of Santa Cruz, together with right-wing prefects (governors) from the other opposition controlled departments (states) in Bolivia’s east, were involved in violent takeovers of government buildings in the region, as part of a coup attempt against the Morales government. 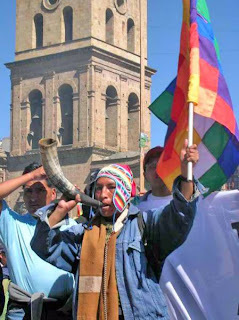 After the massacre of dozens of indigenous peasants in the state of Pando, the Morales government ordered the military to move in against the coup-plotters. At the same time, the nation’s progressive social movements mobilised to go to Santa Cruz, threatening to take over the city. The combined action by the government and the social movements caused the defeat of the coup attempt. This opened the way for the approval of a new constitution, which was ratified in a national referendum with 60% support in January. The new constitution radically increased the rights of indigenous people and recognised state control of Bolivia’s natural resources. “For us, the December 6 elections are very important”, said Loayza. “We want to ratify our indigenous President Evo Morales and our vice president Alvaro Garcia Linera, and above all guarantee a two-thirds majority” in the national assembly. “Until now, although we have controlled the executive power, the government, this has not been enough. The judiciary is controlled [by the right wing]; they control the Senate too. “That is why more than 100 laws that the executive has sent to the Senate have been blocked. It has only been due to the mobilisation of the social movements that we have been able to approve some laws. That is why it is important that we win a majority in the Senate. “This is the body where we will be able to put the new constitution into practice. We want to consolidate this process and we will only be able to do this as long as we have the necessary support at the national level. In this context, “the social organisations have begun to unite and become stronger than ever”, added Apaza. According to a recent Gallup poll, Morales has 57.7% support among voters. His next closest competitor, millionaire Samuel Doria Media, has 9.7% support, followed by the former prefect for Cochabamba, Manfred Reyes Villa, who was revoked from his post in a recall referendum in 2008, with 8.6%. Loayza told GLW that the right wing has “no solid candidates <193> they don’t have political arguments. Private corporations control most of Bolivia’s media. Loayza said that they had used this power to “confuse and misinform the population”. However, Loayza said, “we believe that these deep transformations have to be extended throughout all the Americas. This process, headed by Bolivia, Venezuela and Ecuador, has to radiate throughout all of Latin America and transcend the borders of Latin America.